In the heart of the spectacular Rocky Mountains, Mount Robson Provincial Park protects 219,829 ha (543,219 acres) of rugged mountains, sparkling lakes, vast alpine, and excellent camping. Linked with Jasper National Park, Banff National Park, Hamber Provincial Park, Kootenay National Park, Mount Assiniboine Provincial Park and Yoho National Park, the park is part of an enormous protected area. This large complex of parks is so important that in 1990 the United Nations Educational, Scientific and Cultural Organisation (UNESCO) declared it the Rocky Mountains World Heritage Site. A World Heritage Site is an area that the United Nations recognizes is of global importance, and Mount Robson Park is definitely a key component of the Rocky Mountains UNESCO site. The park (BC's second-oldest) contains the impressive massif Mount Robson, which at 3,954 m (12,972 feet) is the highest peak in the Canadian Rockies. Although not as dramatic as the large peaks, a premier ecological feature of the park is that it protects the headwaters and first 100 km (62 mi) of the Fraser River. From its beginnings as an icy trickle in Mount Robson Park the Fraser, BC's most important river and the largest salmon producing river in the world, flows 1,378 km (856 mi) to the Pacific Ocean. "From its beginnings as a icy trickle in Mount Robson Park the Fraser, BC's most important river and the largest salmon producing river in the world, flows 1,378 km (856 mi) to the Pacific Ocean." Mount Robson Provincial Park is located in east central BC, on the BC/Alberta border. Jasper National Park is located in Alberta, adjacent to and east of Mount Robson. Mount Robson Park can be reached by travelling 345 km (215 mi) north from Kamloops along Highway 5, or by travelling east from Prince George for 280 km (175 mi) on Highway 16. Alternatively the park can be reached from Alberta by travelling west from Edmonton on Highway 16 for 380 km (235 mi). In addition to access by car, Mount Robson Provincial Park has both Greyhound Bus and Via Rail service. There are 3 different vehicle accessible campsites at Mount Robson Park, Robson Meadows, Robson River, and Lucerne. Reservations are available at Robson Meadows, the largest of the three campsites. Lucerne is the most remote and the most rustic, while the other two are within walking distance of the main Visitor Center. Backcountry campsites are available along the Berg Lake Trail and on several trails originating in the main Highway 16 corridor. The Lucerne campsite also has two walk/cycle-in sites. Hikers are reminded that during high season the Berg Lake Trail is busy and that unless reservations are made in advance, there may be difficulties obtaining a campsite or even getting on the trail. Group campsites are available by reservation at Robson Meadows, and at Whitehorn and Robson Pass campsites on the Berg Lake Trail. Picnic spots are found a various sites along the main highway corridor, as well as five km (three mi) down the Berg Lake Trail, at the south end of Kinney Lake. 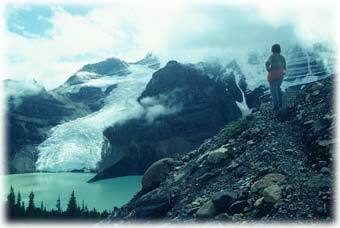 Mount Robson Park has numerous trails for hikers of all levels to enjoy. The Berg Lake Trail, one of the longest, is actually a series of trails that run for approximately 23 km (14 mi) to and around Berg Lake. These trails offer something for a range of hikers, from beginner to experienced. Shorter, but still interesting and beautiful hikes and walks leave from all three campsites, as there are multiple trailheads along the corridor. Some of these trails are self-guided or offer signed interpretive walks. The Berg Lake Trail is also the access route for climbing Mount Robson itself, which is considered an extremely challenging mountain to climb. Only properly skilled, equipped, and experienced climbers should attempt this difficult 3,954 m (12,900 ft) peak. The water in Mount Robson's lakes is mostly fed by melt water flowing from the surrounding glaciers. Hence, they are icy cold, and thus swimming is not a key feature of the park. A swimming beach is however located at Lucerne campsite on Yellowhead Lake. Moose, Yellowhead and Whitney Lakes, located along the Highway 16 corridor, each have a boat ramp and are suitable for canoeing and boating. Boaters are warned that these lakes are commonly subject to strong winds. For those who enjoy fishing, Portal and Whitney Lakes offer small Rainbow Trout, while Yellowhead and Moose Lakes contain Dolly Varden, Lake Trout, Rainbow Trout, Kokanee and Whitefish. There is also seasonal fishing permitted in the Fraser River. All anglers require a valid fishing licence. "The water in Mount Robson's lakes is mostly fed by melt water flowing from the surrounding glaciers." Mount Robson Provincial Park is truly a mountain park. Its four biogeoclimatic zones support a range of different ecosystems from lush valley bottom to ice-clad peak. The lowest zone, Interior Cedar Hemlock, the Interior wet belt forest is found in the valley bottoms. With the rise in elevation, this zone gives way first to Sub-boreal Spruce, then Englemann Spruce-Subalpine Fir, and finally to Alpine Tundra zone. In addition to these main ecosystems, there are also important wetlands found within the park. It is not only the vegetation type that changes from zone to zone but also the animals. The range of zones and extensive wilderness in Mount Robson Park makes it possible for a large variety of animal species to thrive. 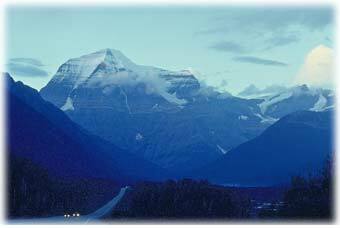 In fact, some 42 species of mammals, four amphibians, one reptile and 182 species of birds call Mount Robson home. Of the mammals, the best known include black and grizzly bears, wolves, mountain goats, elk, moose and deer. In addition to its own ecological significance, Mount Robson Provincial Park makes an important contribution to a much larger protected area, the Rocky Mountains World Heritage Site. This large protected area complies with Conservation Biology principles. The natural systems here- both plant and wildlife - are protected in such a large expanse so as to allow entire ecosystems to continue to flourish over time. "The variety of zones and extensive wilderness in Mount Robson Park makes it possible for a large variety of animal species to thrive." 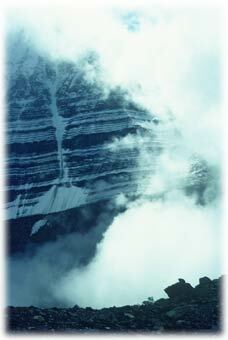 The first people known to inhabit the Mount Robson area were the Texqakallt First Nation. These people lived near the headwaters of the Fraser River and referred to Mount Robson itself as ÔYuh-hai-has-kun' or 'The Mountain of the Spiral Road', on account of its layered nature. These native peoples played a large and important role in aiding the early explorers who eventually reached the area. One of these earliest explorers Pierre Bostonnais arrived in the region in 1820. Bostonnais, an Iroquois Indian, led the first Europeans - Hudson Bay Company employees - through Yellowhead Pass. Yellowhead Pass, the Yellowhead Highway, and Tete Jaune Cache (Tete Jaune is French for Yellow Head) are all named for Bostonnais who, although he was Native, was known for having unusually light hair. With the arrival of Europeans, the area became the site of much trapping and hunting, prospecting, exploration, and transportation. In the 1860s and 1870s, the Yellowhead Pass was surveyed as the most likely railway route through the Rocky Mountains, in order to link the British Columbian colonies with the rest of Canada. This plan was abandoned with the discovery of Kicking Horse Pass, but a railway (the Grand Trunk Pacific) was eventually built through Yellowhead Pass in the early 1900s. To this day the park contains important transportation routes, which are confined to the main Fraser River valley bottom leaving a large expanse of wilderness intact. "In the 1860s and 1870s, the Yellowhead Pass was surveyed as the most likely pass for building a railway through the Rocky Mountains to link the British Columbian colonies with the rest of Canada."